Los Angeles, City of Angels. A city with a remarkable history, over 200 years old. 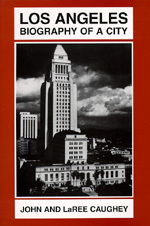 Interwoven with the Caughey's commentary are over 100 of the choicest essays on Los Angeles. The saga of cowtown turned post-war metropolis unfolds before the reader.